Those folks at the Guardian just love Manchester blogs: MBA best new blog winner Renter Girl is the latest to be featured in its hallowed pages. An excerpt from her blog appears on Page 2 of today's Society section - a really nicely-written bit about the cleaner at her infamous abode, Dovecot Towers. Well done! Another Blog Awards winner, Chris Killen of Day of Moustaches, has embarked on a very interesting project: The Cat Boat. There are some cats on a boat. The boat is in the middle of the Pacific Ocean. There are some cats on it. The cats are in charge of the boat. There are one hundred and fourteen cats on the boat. The cats have given the boat a name. They have called the boat ‘The Cat Boat’. The boat is like a pirate ship, but with cats on it instead of pirates. The cats take it in turn to ‘man the rigging’ and ‘carry the Christmas pudding’ and ‘play the record album’. The cats are listening to Tunnel of Love by Bruce Springsteen on repeat. This is their favourite album. It is somehow easier to take songs about low-down American drifters and transmute that experience into the experience of some cats on a boat, than it is, for instance, to take some songs about gangs or about love and transmute those. Here is the list of 114 cats on the boat. Killen is inviting writers to send in each cat's story, which he will then post on his blog. Lots of good stories there already, but lots of good cats left. 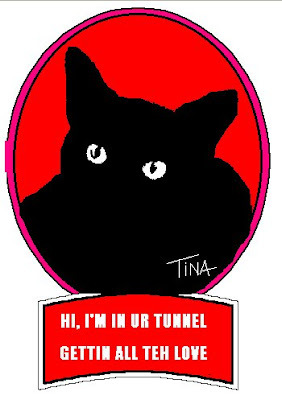 There is also a "Tunnel of Love" drawing competition (see the example above.) Go write about cats! My favourite cat is whatthehellamidoingwhyaminotworkingonmynovel?, which really sums up this whole post perfectly. Thanks for the credit, but I didn't actually submit that picture. Some anonymous person produced that fine example of computer art, whereas my efforts have a more childish style. All interested writers or keen artists should have a go and submit something on the Cat Boat to keep it saling! Oh, sorry Duncan - don't know how that happened, but I'll change it. Anyway, I hope we get some more cat boat work out of this post.